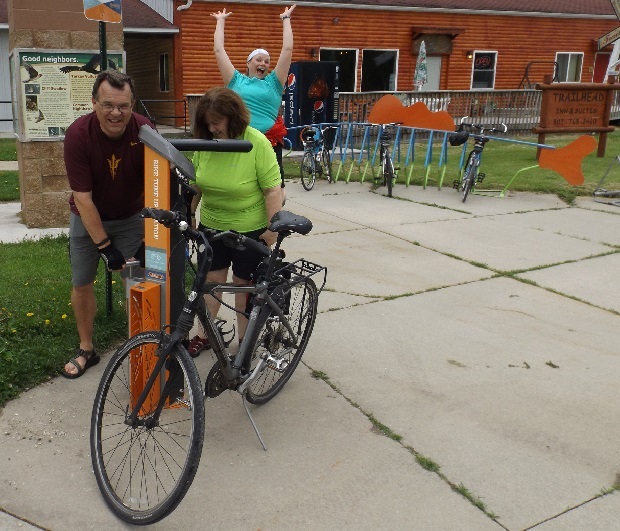 A lonely spectator cheers on couple doing an “ABC” check (air, brakes and crank) on their bike at the Pedal MN Bike Repair Station, in Preston, MN. This is one of eight, trail head repair stations along the Root River Trail System, in Southeastern Minnesota. See the handy At-a-Glance Root River Trail Town article for information on HaveFunBiking.com. This entry was posted in Destinations, News and tagged Bike repair station on May 21, 2015 by Russ Lowthian. 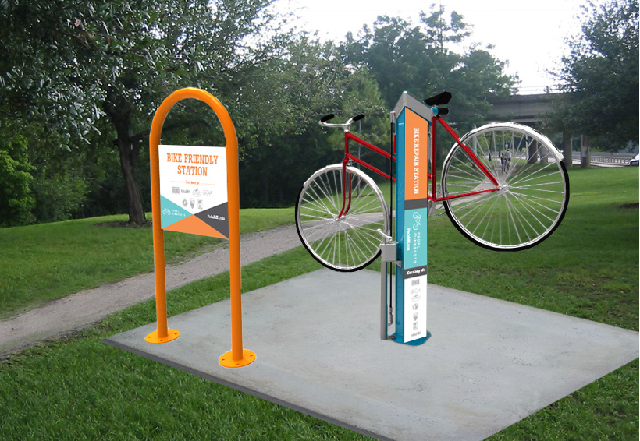 Thanks to the Preston Area Community Foundation and the Preston Tourism Board there will soon be a, free to the public, deluxe bike repair station along the Root River trail, at the trailhead in Preston, Minn.
On the Root River Trail the bike station at the trailhead in Preston will look similar to this. The deluxe public work stand is complete with everything you need for minor bicycle repairs. The station has durable, universal bike tools, wide branding panels, an integrated air pump, and a wheel chock to allow one bike to fill its tires while another bike is using the tools. There’s even a QR code on the side where users can scan their phone and receive step by step instructions on minor repairs. “Preston continues to strive as a bike friendly city and this is another step in that direction. This repair stand will hopefully be up and ready to go in the next month or two. 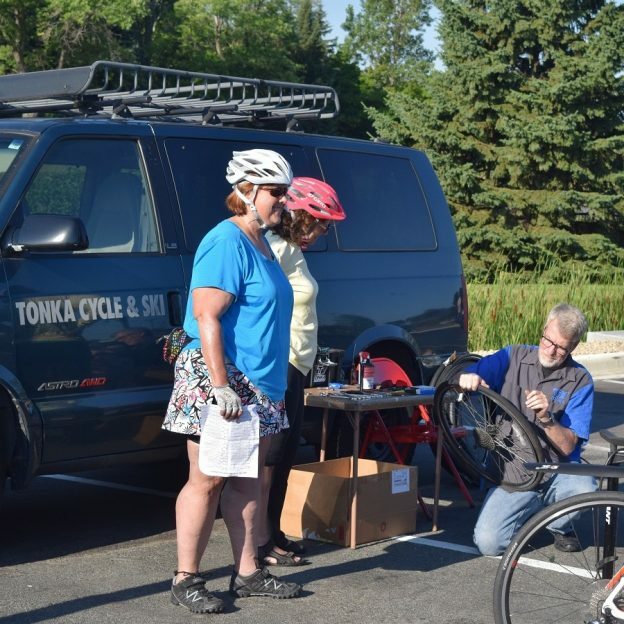 In the meantime feel free to pass the word to all of your bicyclist friends that it will be here soon,” says Sarah Wangen, Preston Chamber Director. This entry was posted in News and tagged Bike repair station, Repair station along trail on September 29, 2014 by Russ Lowthian.